There are three ways to become The Hulk. The first and least advisable method is to bombard yourself with enough radiation that you’ll glow like the Vegas Strip for a hundred years. The second route is to spend eight hours at the gym and eat the equivalent of 100 steaks’ worth of protein every day for the rest of your life. This is expensive and time intensive, and you won’t even turn green as the result of it, so there’s almost no point. The third and best way to be The Hulk is to buy our Hulk Avengers 2 Makeup Kit. 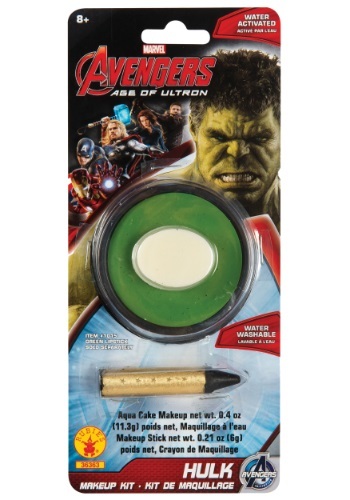 It has a all the green body paint and applicators you need to turn yourself into everyone’s favorite rage-fueled human wrecking ball in a matter of minutes, saving you the trouble of radiation poisoning or sore biceps.